Snapware now available at Homes N Things! The Snapware brand was founded on two principles: simplifying and organizing your life. Their secure-sealing storage containers offer easy solutions to everyday life and in turn help make your life simpler. Snapware designs its containers with modern, busy lives in mind. Every piece is smart, flexible, durable and versatile. The Snapware Total Solution Glass Rectangular Container (6 Cup) combines an air-tight and leak-proof, four-latch plastic lid with a Pyrex® oven-safe glass vessel. The upgraded lid design provides solutions for storage and organization. The Snapware Total Solution Plastic Rectangular Container (3 Cup) features an air-tight and leak-proof, four-latch plastic lid. The upgraded lid design provides solutions for storage and organization. The Snapware Total Solution Plastic Square Container (1.34 Cup) features an air-tight and leak-proof, four-latch plastic lid. The upgraded lid design provides solutions for storage and organization. The Snapware Total Solution Plastic Square Container (10.5 Cup) features an air-tight and leak-proof, four-latch plastic lid. 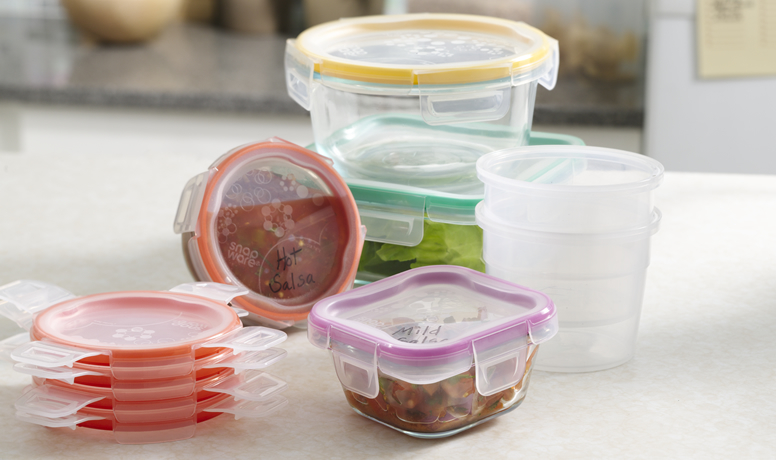 The upgraded lid design provides solutions for storage and organization. Keep your cake intact while you travel with the Snapware Cake Keeper. Comes with a securable lid and a cake server that attaches to the lid of the cake keeper. Dishwasher, microwave and freezer safe. The Snapware® Snap ‘N Stack® Cookie & Cupcake Keeper is perfect for bringing treats to a picnic or party. Durable handle is great for portability and internal trays are reversible for cupcakes or cookies and quarter sheet cakes. The paired back design of the Kas Room Ava Quilt Cover radiates simple sophistication. The Kas Ava Quilt Cover features an organic hand painted spot contemporarized by the use of a pin tucked surface treatment. Together with a contrasting graphic geometric reverse and pop piping this design exudes class with a cheerful twist. The Kas Ava Quilt Cover can be complemented with a variety of coordinating Kas cushions and throw rugs for an extra special touch. Abode Aroma, the interior fragrance specialists, creates interior fragrances to enhance your living spaces and to create an ambient oasis for the senses. Their vast range of aromatic diffusers will scent your living spaces with an exquisite fragrance, allowing you to enjoy scent in your home and to create the perfect finishing touch to any decor. Experience sophisticated elegance, created for ongoing admiration, with the Abode Aroma Bevelled Perfume Candle (Splash of Blu Water). Each box comes with an exquisite bevelled crystal holder to hold the candle and a Splash of Blu Water-scented candle. Comes beautifully gift-boxed, making it suitable for a lavish gift. The Abode Aroma Bevelled Crystal Diffuser Refill (Splash of Blu Water) contains a 200mL bottle of Crisp White Linen perfume to replenish the bevelled crystal diffuser. Experience sophisticated elegance, created for ongoing admiration, with the Abode Aroma Bevelled Crystal Diffuser (Splash of Blu Water). Each box comes with an exquisite bevelled crystal holder to hold the diffuser liquid and reed sticks for a stunning presentation, and a 140mL bottle of the Splash of Blu Water perfume. Comes beautifully gift-boxed, making it suitable for a lavish gift. Experience sophisticated elegance, created for ongoing admiration, with the Abode Aroma Bevelled Perfume Candle (Pearl Tuberose). Each box comes with an exquisite bevelled crystal holder to hold the candle and a Pearl Tuberose-scented candle. Comes beautifully gift-boxed, making it suitable for a lavish gift. The Abode Aroma Bevelled Crystal Diffuser Refill (Pearl Tuberose) contains a 200mL bottle of Crisp White Linen perfume to replenish the bevelled crystal diffuser. NOTE: This product is a refill only and does not include the bevelled crystal diffuser. Experience sophisticated elegance, created for ongoing admiration, with the Abode Aroma Bevelled Crystal Diffuser (Pearl Tuberose). Each box comes with an exquisite bevelled crystal holder to hold the diffuser liquid and reed sticks for a stunning presentation, and a 140mL bottle of the Pearl Tuberose perfume. Comes beautifully gift-boxed, making it suitable for a lavish gift. The Baker’s Secret Silicone Coated Whisk (Large) is great for whisking without the fear of scratching non-stick coatings. Dishwasher safe for convenience, BPA-free and the heat resistant silicone can withstand up to 200°C. The Baker’s Secret Silicone Coated Whisk (Small) is great for whisking without the fear of scratching non-stick coatings. Dishwasher safe for convenience, BPA-free and the heat resistant silicone can withstand up to 200°C. Create 12 mini muffins in one go with Baker’s Secret 12-Cup Muffin Pan.Great for kids parties, entertaining, cake decorating or a fabulous mini treat for yourself. NOTE: This mini muffin pan is the newer model from Baker’s Secret and features a slightly different shape to the previous. Make decorating cakes easy with the Baker’s Secret Cake Decorator Turntable. Place the cake on the stand and rotate while you decorate for a more consistent result. Ecoya’s vision blends luxury and all natural, a promise to present the best possible home fragrance and body care experience. Inspired by the rich history of Botany Bay, scents discovered centuries ago lie at the heart of their collection. Whether in the form of waxes, oils, soaps or lotions, these aromas carry us to moments that evoke our past and inspire our future. Today Ecoya is found in 15 different countries and has capitvated a global following in the most powerful sense. White coconut and caramel are combined in the Ecoya Madison Glass Jar Candle (Coconut and Elderflower) with elderflower and immersed in a rich background of lime, bergamot, lemon and pineapple to create a warm refreshing fruit cocktail. Approximately up to 80 hours burn time. This natural soy fragranced candle is beautifully gift boxed. The essence of a crisp tree ripened pear is captured and blended with a hint of the creamiest vanilla in the Ecoya Madison Glass Jar Candle (French Pear). This sophisticated and rich combination is then infused with star anise for a scent akin to freshly baked apple crumble. Approximately up to 80 hours burn time. This natural soy fragranced candle is beautifully gift boxed. Ginger and freshly cut lemongrass are blended with African mint and aromatic herbs to create a balanced and refreshing classic in the Ecoya Madison Glass Jar Candle (Lemongrass & Ginger). Approximately up to 80 hours burn time. This natural soy fragranced candle is beautifully gift boxed. In the Ecoya Madison Glass Jar Candle (Lotus Flower), a heavenly blend of white lotus flower is contrasted with deeper shades of vanilla and patchouli to create a warm and delicately spicy mix that is both sensual and relaxing. Approximately up to 80 hours burn time. This natural soy fragranced candle is beautifully gift boxed. Cool transparent aqua accords in the Ecoya Madison Glass Jar Candle (Seagrass & Water Lily) are blended with delightful fragrant water lillies and night blooming jasmine on a white musk base. Approximately up to 80 hours burn time. This natural soy fragranced candle is beautifully gift boxed. NOTE: The Seagrass & Water Lily is a limited edition fragrance. The aroma of the Ecoya Madison Glass Jar Candle (Guava & Lychee Sorbet) features layers of delicious guava nectar interwoven with the sparkling sweetness of lychee, underpinned by voluptuous tropical berries. Approximately up to 80 hours burn time. This natural soy fragranced candle is beautifully gift boxed. Enchanting sweet pea and white jasmine in the Ecoya Madison Glass Jar Candle (Sweet Pea & Jasmine) entwine to capture the very essence of floral elegance. Delicately uplifting notes of watermelon and cucumber add extra freshness to round out the composition. Approximately up to 80 hours burn time. This natural soy fragranced candle is beautifully gift boxed. A velvety and rich, full bodied vanilla bean extract is deliciously wrapped in creamy tones of butterscotch to create a rich, indulgent and luxurious fragrance in the Ecoya Madison Glass Jar Candle (Vanilla Bean). Approximately up to 80 hours burn time. This natural soy fragranced candle is beautifully gift boxed. The Voluptuous frangipani and ylang ylang in the Ecoya Madison Glass Jar Candle (Wild Frangipani) tantalize your senses with their irresistible island beauty and are combined with the subtle classicism of rose. Approximately up to 80 hours burn time. This natural soy fragranced candle is beautifully gift boxed.